Recently we happened upon this 2015 Q&A on Quora.com that busts several myths at once, in a friendly and concise way. Q. Does it look like Yellowstone is going to erupt soon? A. There are no signs that we know of that point to an eruption any time soon. However, since we have never seen a volcano like Yellowstone erupt, we can’t be sure what the warning signs of an eruption would be. Some sensationalist sources take every little twitch from the volcano, and even events unrelated to geologic activity, as signs of an impending eruption. Don’t take them seriously. In better news, at least one study has suggested that the magma chamber beneath Yellowstone is partially solidified to the point that it currently cannot erupt unless it gets a fresh batch of hot magma from the mantle. One little misconception that should be covered here: Yellowstone is not “overdue” for an eruption. The little factoid that Yellowstone erupts regularly every 600,000 years is untrue. So-called super eruptions occurred 2.1 million, 1.3 million, and 640,000 years ago, which gives intervals between eruptions of 800,000 and 660,000 years, though three eruptions are not enough to establish a reliable recurrence interval. Credit: This answer on Quora was written by Nicholas Schiff, B.S. Geology, Mercyhurst University, Erie, PA. 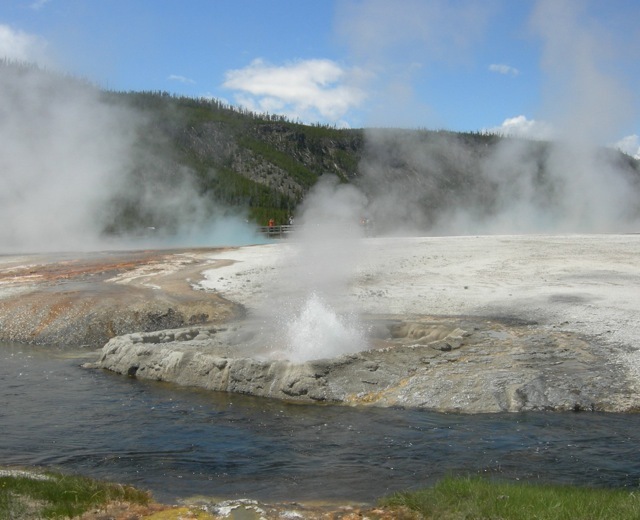 In the guidebook: There’s much more in Yellowstone Treasures about the Yellowstone hot spot and supervolcano, especially in the Geological History chapter, pages 303 to 318. Comments Off on Is Yellowstone about to blow? 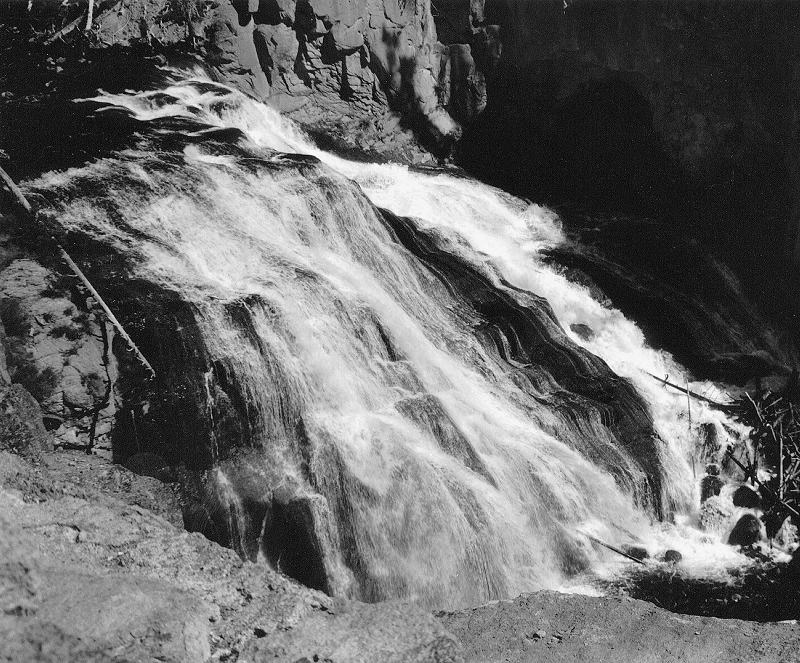 Gibbon Falls is near the edge of the Yellowstone Caldera. A good place to see the caldera rim is between there and Madison Junction. Frequently I hear the question “Is Yellowstone about to blow?” as I run into acquaintances here at Lake Park Retirement Center. My best answer is usually “Not on my watch” or maybe “I’m going there again soon, and I definitely don’t worry about that.” We have treated the supervolcano issue in several posts on this website in recent years. Here also is a recent reassuring statement I found thanks to the Yellowstone Insider website. The news was about a 100-foot-long fissure found near Hidden Falls in Grand Teton National Park. Photo credit: Leslie Kilduff, 1996. The photo has been reproduced in Yellowstone Treasures from the first edition to the current fifth edition, where you can find it on page 290.